Two women, the mother and the adoptive mother, hugged and cried and prayed as the little children they shared looked on one day last July. The adoptive mother, Betsy Lee, was moving the next day from Beaver to Texas, half a country away. The mother, Leanore Weigner, was losing her children for a second time. The first time, Beaver County Children and Youth Services had taken them from her. Lee held Weigner a long time, trying to comfort her. Then the little ones, Mary, 6, and Charles, 5, hugged their mother goodbye, climbed into Lee's Jeep and left. Her face crumpled in agony. She wanted her children back -- not just Mary and Charles, but three others who were living with a foster family that intended to adopt them. Betsy Lee and her husband, Dr. John Lee, had been willing to relinquish Mary and Charles if that's what Weigner had wanted and if an appeal had allowed it because, Betsy Lee said, "It is a terrible injustice what happened to her." But Weigner wouldn't appeal. She didn't want the children moved again and hurt again, not, she said, after CYS had put them "through heck and back." All she wanted was for someone to stop CYS from doing what it had done to her. CYS had terminated her parental rights to five children. It had the legal authority to do that, but the way CYS, the Beaver County courts and even Weigner 's court-appointed attorney behaved during that painful procedure appears to have violated Weigner's rights to due process, as well as state and federal regulations regarding abused and neglected children. And Weigner's story is not an anomaly in Beaver County. Her saga began long before she moved to Beaver County or met a CYS caseworker. It goes back to her hometown of Carnegie on the last weekend of October 1983, just days after Weigner's 11th birthday. That's when her stepfather sexually molested her. Allegheny County's Office of Children, Youth and Families placed Weigner and her sister, Dawn Conrad, in foster care. When Dawn turned 18 and left foster care, Weigner, a mildly retarded girl, lost her sister's support. She ran away almost immediately. It was 1987. She was 15 and living like a nomad, sometimes with her sister, sometimes with other relatives. She attended school for a time but dropped out after 8th grade. She never made it to high school. A few months after running away, she met Alvin Shriver, a violent 16-year-old, who, unfortunately, took a fancy to her. Except for the four beautiful children they produced, nothing good came of their relationship. They traveled from one city to the next in Pennsylvania and Ohio. They were in Steubenville, Ohio, when Weigner became pregnant with their first child. She said she was eight months along when Alvin Shriver knocked out her front teeth. Later, he would smack the second child across the face with a hot spatula because he was crying for eggs. The first baby, J.S., a girl, was born on June 15, 1990, when Weigner was 17. Within four years, there were three more -- D.S., a boy, in 1991, Mary in 1993, and Charles in 1994, six days after Weigner's 22nd birthday. At that point, she was an unskilled, undereducated mother of four, economically dependent on a violent man. That's when she began her second fateful relationship. Shriver had introduced her to his cousin, James Boyce, and Boyce was appalled by what he saw going on in their household. He told Weigner it wasn't right. He encouraged her to leave. When Weigner finally got the courage to tell Shriver she was going, he savaged the apartment, smashing, among other things, the children's fish tank, then forcing them to watch their pets suffocate. The Beaver Falls police arrived, and Weigner and the children escaped. But then her trouble with CYS started. She traces it back to a jealous Shriver, who couldn't stand the idea of her and Boyce being together. Not long after she and Shriver had split up, he was convicted of setting his aunt's home on fire while she, Boyce, and Shriver's grandfather slept inside. They escaped unharmed. Shriver was sentenced to four to 10 years in prison for arson and reckless endangerment. Before he set the fire, Weigner believes Shriver told CYS about his cousin's juvenile criminal record. Boyce said he didn't really do anything. According to his account, he and another boy were baby-sitting, and the other boy sexually assaulted the child while Boyce was out of the house. Boyce was charged in the case, and while he doesn't remember exactly what crime he was accused of, he knows that he was given probation and never spent time in a juvenile detention center. Boyce's story has some credence, because if he had been convicted of a serious sexual assault, his juvenile record would be public information -- and it isn't. CYS wasn't willing to take any chances, though. Weigner said a caseworker told her in the fall of 1995 that she was never to leave the children alone with Boyce. Weigner was unfazed by the demand, because, she said, she never left her children alone, not even with a baby-sitter. Although she did not believe Boyce had committed a sexual assault as a juvenile, Weigner would never let him or anyone else touch her children. She'd been a victim; she was determined not to let it happen to her children. A few months later, as she and Boyce's mother, JoAnn Boyer, were fixing dinner for the children at Boyer's home in Freedom, a CYS caseworker arrived. It was Dec. 4, 1995. That was the last day Weigner ever cooked for her children. CYS accused Weigner of leaving the children alone with Boyce. They took the children away from her and parceled them out to different foster homes. Mary, who was 2, and Charles, who was 1, were put in one home, while D.S., who was 4, and J.S., who was 5, were placed in another. Weigner's sister tried to rescue them. Dawn Conrad called CYS and asked that her nieces and nephews be placed with her. She felt the children should be together and remain with family, and they knew her and her husband because Weigner had spent a month with them earlier that year. But, she said, CYS wouldn't even consider her, telling her it would be impossible to place the children outside Pennsylvania. Conrad and her husband own a home in Wintersville, Ohio, 18 miles from the Pennsylvania line. Both state and federal law permit placement across state lines. Beaver County CYS has placed children outside Pennsylvania in other cases. But it refused this time. In addition, both state and federal law require agencies to consider placement with relatives before strangers. Yet CYS wrote on Weigner's court papers, "At the time of placement, there were no appropriate relatives to care for the children." CYS Director Victor Colonna said state law bars him from discussing specific cases, but he said CYS must have had a reason if it did not place children with a relative. Betsy Lee, the adoptive mother of Mary and Charles, was furious when she found out the agency refused to place children with Conrad. Much as she loves Mary and Charles, she believes they belonged with family first. "It breaks my heart. All five kids could have been together in a stable home four years ago." The CYS decision to reject the Conrads was particularly costly to J.S. and D.S., because they would end up being passed from one foster home to the next. D.S. bounced through five homes in four years; J.S. went to four. Each time a child is moved, psychiatrists say, he or she is less able to bond, less able to love, more likely to suffer debilitating emotional disorders. After what happened to D.S. and J.S. within CYS' child protective system, it wouldn't be hard to conclude that they'd have been better off staying with their mother, Lee said. That is not, however, the conclusion CYS came to. The agency asked Juvenile Court to declare the children abused or neglected because "Ms. Weigner left the children alone with Mr. James Boyce, a known perpetrator of sexual abuse, despite being repeatedly warned that he is to have absolutely no contact with any of the children." Boyce could hardly be described as a known perpetrator, since his juvenile record was sealed, and he had no adult record. And, Weigner said, she was only told not to leave the children alone with him. When the Juvenile Court hearing was held, Weigner had no attorney present to argue her case, and the judge decided not to give the children back to her. She said she didn't know how to get a free lawyer, and she said no one told her how. Court officials say they always tell parents how to get free lawyers. But Weigner, because of her limitations, may not have understood. State regulations say parents are entitled to legal representation at every hearing, yet the court didn't appoint a lawyer for Weigner until at least the third hearing, about a year later. When CYS took her children, Weigner was four months pregnant with Boyce's baby, and terrified that CYS would take that child. too. But then a caseworker visited her and Boyce at his mother's house in Freedom and said they could take the baby home when it was born, for at least a couple of weeks. Weigner and Boyce stacked up diapers and bought formula, clothes and a bassinet. Richard Boyce was born on May 12, 1996. Based on the caseworker's promise that she could take him home and her belief that five children were all she could handle, Weigner got surgically sterilized immediately afterward. The next day, the caseworker went to the hospital and took Richard. The only baby picture Weigner has of him is the one taken there. CYS placed Richard with George and Tamell Huffmyer, who was the volunteer foster parent liaison for CYS. Although J.S. and D.S. had been placed in another home initially, they had been moved to the Huffmyers by the time the baby was born. Shortly after the Huffmyers got the baby, though, they insisted that CYS move D.S. out of the home. It's not clear why, and the Huffmyers declined to discuss it. When the caseworker showed up at the maternity ward, Weigner had been dressing to leave. Boyce's mother, JoAnn Boyer, was holding her infant grandson in her arms. After the caseworker took the baby, Boyce stormed out, an omen of things to come for him and Weigner. CYS then gave Weigner and Boyce "family service plans," which are supposed to be road maps to possible reunification of parents and children. Under the plans, parents must meet some goals so the children can return safely, and the agency is supposed to help them achieve those objectives. The idea behind the service plans is that the quicker children go home, the less trauma they will suffer and the less cost taxpayers will incur for keeping them in foster care. Weigner was a parent who definitely needed help. Besides being a mildly retarded junior-high dropout who'd been a victim of both sexual assault and domestic violence, she had only held a job or leased an apartment of her own for a few months. Despite its duty and Weigner's clear need, CYS did virtually nothing to help her. One of the goals she had the most difficulty meeting was getting decent, stable housing. She didn't have money for a security deposit. And she couldn't get into a public housing apartment unless she paid $908 she owed in back rent and repairs from a previous stay in public housing. That was an amount far beyond her means. These, however, are problems many child welfare agencies solve. The Allegheny County CYF, the counterpart to Beaver County CYS, does it all the time. It connects parents to agencies that will help pay overdue utility bills and security deposits. CYF will buy a parent a refrigerator or a stove if that's the roadblock to returning the children. And CYF has a special program to help parents get public housing. Beaver County CYS did none of this for Weigner. Boyce said CYS did not help him either, and in fact worked against his success. The agency required him to go to classes for sexual offenders, which were held during times when he was supposed to be working. He lost his job because he attended the classes. Then he didn't have the money to pay for the classes, and CYS wouldn't cover the cost, so, he said, he didn't finish them. That meant he and Weigner couldn't get their baby, and Weigner couldn't get her other children back. They agreed to separate. Weigner moved to New Brighton. She completed many of the goals CYS set for her. She graduated from the parenting school. A homemaker inspected her apartment and found it clean and well stocked with food. She never missed a visit with her children. But after doing all that, she still faced a huge obstacle. By this time, CYS had accused Boyce of molesting one or more of Weigner's children. Three months after Richard was born, the Beaver County district attorney's office charged Boyce with a dozen counts of corrupting minors and indecent assault, although the charges didn't specify the victims. Boyce flatly denies any molestation. Weigner doesn't believe he did it, partly because her children never mentioned it. When she would try to ask them about it during visits, the CYS caseworkers would tell her not to bring it up. CYS director Colonna said a supervisor may ask parents not to discuss sexual abuse if he feels the questions are an attempt to influence the child during an investigation. Betsy Lee said it was clear to her that neither Mary nor Charles was a victim, because they never exhibited the sexualized behaviors associated with it. Despite the serious charges leveled against Boyce, the district attorney allowed him to enter a special program designed for first-time offenders, almost all of whom are accused of nonviolent crimes. It's not clear how an option meant for nonviolent offenders could be offered to someone charged with numerous counts of indecent assault, other than the possibility that the prosecution felt it might not win at trial. Boyce's public defender advised him to take the offer, rather than face the possibility of conviction and jail time. Boyce said he agreed because the lawyer assured him that entering the program, called Accelerated Rehabilitative Disposition, wasn't the same as pleading guilty or being convicted. He served one year's probation. Boyce maintains his innocence and remains angry about the accusations. Ten days after Boyce accepted the deal, Weigner was back in juvenile court. It was Nov. 21, 1996, and now, CYS wanted to change the goal for her children from reunification to adoption. Weigner didn't know it then, but CYS was abandoning her in stunningly quick time -- just 11 months after the older children were taken, and six months after the baby was. In 1996, agencies were expected to work with parents for at least 18 months before seeking to terminate their rights. And most tried much longer to help parents get their children back, so that the average parent nationwide got a little more than three years to meet goals before their rights were terminated. The speed of Weigner's termination was not unique in Beaver County. From 1994 through 1998, the most recent statistics available, Beaver County terminated parents' rights twice as quickly as the national average, and even faster when a baby was involved. For the hearing on whether her children should be designated for adoption, the court finally appointed a lawyer for Weigner. That attorney, Cathy Campbell, asked the juvenile court hearing officer, who serves in place of a judge, to give Weigner more time. Hearing Officer John D. McBride agreed, and refused to change the goal to adoption. He ordered CYS to continue to help Weigner get her children back. Despite that, CYS immediately went to an Orphans' Court judge and asked for a hearing to terminate Weigner's parental rights, the first step necessary for adoption. In many other places, including Allegheny County, that wouldn't occur because CYS would have to deal with a single judge throughout a family's case. Weigner's termination hearing was scheduled for Jan. 14, 1997, but Campbell persuaded Beaver County Common Pleas Judge Robert C. Reed to postpone it twice. Weigner had more time. But then CYS began pressuring her in a different way. CYS started pushing Weigner to relinquish her children for adoption, which would avoid the need for a judge to involuntarily terminate her rights. Weigner asked Campbell about it, and Campbell said, "I told her that it was her decision and she needed to understand what she was doing, because you can't go back. I said 'You are struggling, but this is a permanent decision.' "
Campbell said she thought Weigner understood. But Weigner didn't. And Campbell did not offer to go with her when she talked to CYS about it. That should not happen. 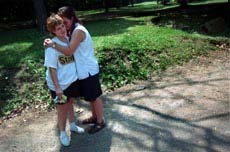 Linda Ehrenreich, who directs the group of attorneys in Allegheny County who represent parents in such cases, said she would be furious if she found out CYS had discussed relinquishment, or a similar procedure called consent, with any of her clients without her lawyer being present, especially if the parent was mentally ill or mentally retarded. Campbell said she didn't know her client was mildly retarded. And, she said, the law doesn't require legal counsel for parents who sign away their rights. Weigner signed the relinquishment on July 28, 1997 -- but she did so partly because she misunderstood what was going on. When CYS told Weigner it would try to terminate her rights if she didn't relinquish her children, she thought termination meant she would be criminally charged and might go to jail. "I was scared because I was never in jail," Weigner said. "I had never even been charged with anything. They had me scared." Colonna, the CYS director, said he can't imagine she got that idea from anyone at the agency. "I would say in no case would a parent be told criminal charges would be filed if they don't sign a voluntary relinquishment." In addition to lacking legal counsel when she needed it, Weigner was not given a court-appointed guardian, which she would have had in Allegheny County, where the courts require such a second line of defense for parents who are under 18 or mentally ill or retarded. Part of the guardian's job is to make sure the parent understands what termination means. That doesn't happen in Beaver County, though. Court rules there require guardians only for parents under 18. On Sept. 23, 1997, a judge severed Weigner's rights to her children forever. At the same hearing, the judge terminated Boyce's rights, although he didn't have a lawyer and wasn't given an opportunity to speak. Now, he said, "I don't believe in the justice system. It isn't any justice at all." Twelve days after the terminations, on Oct. 5, 1997, Joseph Shriver, an infant cousin of Weigner's children, was beaten to death by his foster mother. It traumatized Weigner. Her friends and family called to make sure it wasn't one of her babies. 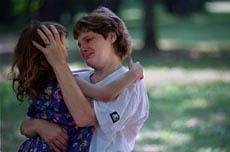 Weigner, who had assumed foster care was safe, began to worry that her children too could be killed by foster parents. She wrote Campbell and asked her to try to reverse the termination of her parental rights. She said she'd been pressured into it. She said she was afraid for her children. Campbell never responded -- despite the fact that in 1992, state Superior Court ruled that lawyers representing poor parents like Weigner in terminations must file appeals when their clients request them. The court said that if the lawyers felt the appeals were utterly frivolous, they could ask for permission to withdraw, but they had to file briefs pointing to any possible appeal issues anyway. Weigner couldn't get any help from Campbell. She was alone and fearful for her children's safety. "They told me to just go on with my life. How could I do that without my kids?" She tried to kill herself. She spent three weeks in the hospital. She began taking medication for depression. But, she said, "Sometimes I get really, really depressed and I don't even want to be around." A year later, in the fall of 1998, Weigner looked up the phone number for John and Betsy Lee, who'd had two of her children for two years at that point. She had met Betsy Lee briefly during visits with Mary and Charles before the termination. Now she'd read a news article saying that CYS had taken from the Lees a 14-month-old baby they'd hoped to adopt, and Weigner wanted to offer her sympathy. Betsy Lee was touched by this kindness from someone who had lost so much. They began talking from time to time. Weigner told Lee bits and pieces of her story. It didn't jibe with what the caseworker had told Lee about her. Lee, already suspicious of CYS because the agency had placed her foster baby with someone else for adoption, began letting Weigner talk to Mary and Charles on the phone. Lee was careful, though, because she feared CYS would take those children away from her, too, if the agency felt she had violated rules. A year after Weigner's rights were terminated -- in the fall of 1998 -- Beaver County CYS still hadn't completed adoptions for any of her children. The Huffmyers were supposed to adopt J.S. and Richard, but they got a divorce, so the two children were sent to live with their brother D.S. in his foster home. Then, last spring, the three children were moved to yet another foster family. The move to a new foster home occurred a year-and-a-half after the termination. The three children would have to be with the new family at least another six months before an adoption could be approved. There was no reason, however, to delay Mary's and Charles' adoption, but it still wasn't scheduled, which was frustrating to the Lees because they were facing a deadline. John Lee had completed his physician's residency and had accepted a job with a practice in Texas. They had rented a house and were to leave Beaver County in July of this year. Betsy Lee's caseworker told her that Mary and Charles might have to stay behind if the adoptions weren't completed before the Lees left. Betsy Lee couldn't bear for that to happen. It would devastate the children as much as it would her and John. One problem the Lees faced was that they had filed a federal lawsuit against CYS over the agency's refusal to let them adopt their foster baby, and they didn't want Robert Masters, the CYS solicitor they named in that suit, to serve as the lawyer for this adoption. CYS finally agreed to let them use a private lawyer, Albert A. Torrence of Beaver. Torrence quickly scheduled a date. On June 29 of this year, Mary and Charles became Lees in a ceremony in which they were joyous and silly, as a 5- and 6-year-old should be. When questioned under oath if she would love and cherish the children as she would the son born to her and John, Betsy Lee said, "I rejoice in it." They celebrated with breakfast at McDonald's, the children's choice. Betsy Lee then called Weigner to make sure she was OK. "I have asked her to be honest with me about what she wanted. She has consistently said she wants what is best for the kids. She has sweetly said we could adopt. But having gone through this situation ourselves with [the foster child], we have to deal with how she is impacted by all of this." After the adoption, Betsy and John Lee let Weigner take Mary and Charles to a fair by herself. Days later, the children were still talking about it -- the popcorn, the rides, the fun with their mother. Once they reached Texas, Betsy and John Lee planned to send Weigner plane tickets so she could visit the children. But before they left, Betsy Lee had to take on the excruciating job of arranging another goodbye between Weigner and her children. She decided to take Weigner and the children to Brady's Run Park in Beaver County. They could play for hours on the swings and slides. Weigner could hug them, kiss them and tell them goodbye again. Both Mary and Charles wrote their mother letters. Charles wrote, "I love you. I miss you. I like to play with you. I don't want to go away." "I never thought this day would come again ... when I had to say goodbye. So I had to write it because I can't say it to your face ... when you go, please remember me and that I love you very much. And you will always be in my mind and in my heart. I really can't explain how I feel right now. "But I can tell you that it hurts more than anything in the world." Suggested citation: American Psychological Association Committee on Professional Practice and Standards (1998). Guidelines for psychological evaluations in child protection matters. Washington, DC: American Psychological Association. The problems of abused and neglected children are epidemic in our society (U.S. Advisory Board on Child Abuse and Neglect (ABCAN), 1995) and create issues that psychologists may be called upon to address. According to the U.S. Advisory Board on Child Abuse and Neglect (ABCAN), conservative estimates indicate that almost two thousand infants and young children die from abuse and neglect by parents or caretakers each year, or five children every day. McClain's research at the Center for Disease Control and Prevention (CDC) suggests that abuse and neglect kills 5.4 out of every 100,000 children age four and under (McClain et al., 1993; McClain, 1995). According to ABCAN, fatalities are not the entire story. There are tens of thousands of victims overwhelmed by lifelong psychological trauma, thousands of traumatized siblings and family members and thousands of near-death survivors who, as adults, continue to bear physical and psychological scars. Each year, 18,000 children are left permanently disabled (Baladerian, 1991). Some may turn to crime or domestic violence or become abusers themselves (ABCAN, 1995). When a child is at risk for harm, psychologists may become involved. Psychologists are in a position to make significant contributions to child welfare decisions. Psychological data and expertise may provide additional sources of information and a perspective not otherwise readily available to the court regarding the functioning of parties, and thus may increase the fairness of the determination by the court, state agency or other party. As the complexity of psychological practice increases and the reciprocal involvement between psychologists and the public broadens, the need for guidelines to educate the profession, the public and the other interested parties regarding desirable professional practice in child protection matters has expanded and will probably continue to expand in the foreseeable future. Although psychologists may assume various roles and responsibilities in such proceedings, the following guidelines were developed primarily for psychologists conducting psychological evaluations in child protection matters.2 These guidelines build upon the American Psychological Association's Ethical Principals of Psychologists and Code of Conduct (APA, 1992)3 and are aspirational in intent. The term "guidelines" refers to pronouncements, statements, or declarations that suggest or recommend specific professional behavior, endeavor, or conduct for psychologists (APA, 1992a). Guidelines differ from standards in that standards are mandatory and may be accompanied by an enforcement mechanism (APA, 1993). Thus, as guidelines, they are not intended to be either mandatory or exhaustive and may not always be applicable to legal matters. Their aspirational intent is to facilitate the continued systematic development of the profession and help to assure a high level of professional practice by psychologists. These guidelines should not be construed as definitive or intended to take precedence over the judgement of psychologists. The specific goal of the guidelines is to promote proficiency in using psychological expertise in conducting psychological evaluations in child protection matters. Parents4 enjoy important civil and constitutional rights regarding the care for their children. A child has a fundamental interest in being protected from abuse and neglect. Child protection laws attempt to strike a balance between these interests. Under the concept of parens patriae, all states have the right to intervene in cases where a child is at risk for harm. State interventions most commonly occur in three stages. In the first stage, following a report of suspected child abuse and neglect5, an investigation occurs. In the second stage, if the findings of the investigation stage indicate the child is at sufficient risk for harm, the state may assume care and/or custody of the child and may make recommendations for rehabilitation of the parents. The third stage may occur if such rehabilitative conditions have failed to create a safe environment for the child's return to the parent(s), or if the child has been returned unsuccessfully. At this point the state may request a hearing for a final disposition. The final dispositional stage may result in involuntary termination of parental rights. Such a disposition typically requires not only a finding of abuse and/or neglect by the parent(s), but also a finding that various rehabilitative efforts with the parent(s) have failed. Psychologists are aware that the most extreme disposition--termination of parental rights--has a finality requiring both due process protection and a higher standard of proof6 than may be used in other child protection matters. During any of the above-mentioned stages, psychologists may be asked to evaluate different parties for different purposes. Psychologists may act as agents of the court, the child protection agency, or may be directly retained by the parent(s). Psychologists may also be retained by a guardian ad litem if one has been appointed to represent the child. 1. How seriously has the child's psychological well-being been affected? 2. What therapeutic interventions would be recommended to assist the child? 3. Can the parent(s) be successfully treated to prevent harm to the child in the future? If so, how? If not, why not? 4. What would be the psychological effect upon the child if returned to the parent(s)? 5. What would be the psychological effect upon the child if separated from the parents or if parental rights are terminated? In the course of their evaluations, and depending upon the specific needs of a given case, psychologists may wish to evaluate the parent(s) and/or the child individually or together. Psychologists may wish to gather information on family history, assess relevant personality functioning, assess developmental needs of the child, explore the nature and quality of the parent-child relationship and assess evidence of trauma. Psychologists are encouraged to consider specific risk factors such as substance abuse or chemical dependency, domestic violence, financial circumstance, health status of family members and the entire family context. Psychologists may wish to review information from other sources including an assessment of cultural, educational, religious and community factors. Particular competencies and knowledge are necessary when performing psychological evaluations in child protection matters so that adequate and appropriate psychological services can be provided to the court, state agencies or other parties. For example, in cases involving physical disability, such as hearing impairments, orthopedic handicaps, etc., psychologists strive to seek consultation from experts in these areas. Particular attention should also be given to other aspects of human diversity such as, but not limited to, ethnic minority status, sexual orientation and socioeconomic status. Conducting psychological evaluations in child protection matters can be a demanding and stressful task. The demand of such evaluations can become heightened because the issues involved may include child abuse, neglect and/or family violence. Psychologists are alert to these personal stressors, and when appropriate, undertake relevant study, training, supervision and/ or consultation. 1. The primary purpose of the evaluation is to provide relevant, professionally sound results or opinions, in matters where a child's health and welfare may have been and/or may in the future be harmed. The specific purposes of the evaluation will be determined by the nature of the child protection matter. In investigative proceedings, a primary purpose of the evaluation is to assist in determining whether the child's health and welfare may have been harmed. When the child is already identified as being at risk for harm, the evaluation often focuses on rehabilitation recommendations, designed to protect the child and help the family. An additional purpose of such an evaluation may be to make recommendations for interventions that promote the psychological and physical well-being of the child, and if appropriate, facilitate the reunification of the family. Psychologists appreciate the value of expediting family reunification when safe and appropriate. (d) the need for and likelihood of success of clinical interventions for observed problems, which may include recommendations regarding treatment focus, frequency of sessions, specialized kinds of intervention, parent education and placement. 4. The role of psychologists conducting evaluations is that of professional expert who strives to maintain an unbiased, objective stance. In performing protection evaluations, psychologists do not act as judges, who make the ultimate decision by applying the law to all relevant evidence, or as advocating attorneys for any particular party. Whether retained by the court, the child protection agency, the parent(s) or the guardian ad litem for the child, psychologists should strive to be objective. Psychologists rely on scientifically and professionally derived knowledge when making judgements and describe fairly the bases for their testimonies and conclusions. If psychologists cannot accept this unbiased objective stance, they should consider withdrawing from the case. If not permitted to withdraw, psychologists disclose factors that may bias their findings and/ or compromise their objectivity.5. The serious consequences of psychological assessment in child protection matters place a heavy burden on psychologists. Because psychologists' professional judgements have great potential to affect the lives of others, psychologists are alert to guard against factors that might lead to misuse of their findings. For example, in an initial dispositional hearing, psychologists' findings may be used to separate the child from her/his parent(s). In a final dispositional hearing, the psychologists' findings may be a factor in the decision to terminate parental rights. The gravity and potential permanence of this consequence underscore the importance for psychologists to reasonably insure the objectivity of the assessment procedure and findings.6. Psychologists gain specialized competence. A. Psychologists who conduct evaluations in child protection matters are aware that special competencies and knowledge may be necessary for the undertaking of such evaluations. Competence in performing psychological assessments of children, adults and families is necessary but not sufficient. Education, training, experience and/or supervision in the areas of forensic practice, child and family development, child and family psychopathology, the impact of separation on the child, the nature of various types of child abuse and the role of human differences.8 may help to prepare psychologists to participate competently in psychological evaluations in child protection matters. B. Psychologists make reasonable effort to use current knowledge of scholarly and professional developments, consistent with generally accepted clinical and scientific practice, in selecting evaluation methods and procedures. The current Standards for Educational and Psychological Testing (APA, 1985) are adhered to in the use of psychological tests and other assessment tools. C. Psychologists also strive to become familiar with applicable legal and regulatory standards and procedures, including state and Federal laws governing child protection issues. These may include laws and regulations addressing child abuse, neglect and termination of parental rights. 7. Psychologists are aware of personal and societal biases and engage in nondiscriminatory practice. Psychologists engaging in psychological evaluations in child protection matters are aware of how biases regarding age, gender, race, ethnicity, national origin, religion, sexual orientation, disability, language, culture and socioeconomic status may interfere with an objective evaluation and recommendations. Psychologists recognize and strive to overcome any such biases or withdraw from the evaluation. When interpreting evaluation results, psychologists strive to be aware that there are diverse cultural and community methods of child rearing, and consider these in the context of the existing state and Federal.9 laws. Also, psychologists should use, whenever available, tests and norms based on populations similar to those evaluated.8. Psychologists avoid multiple relationships. In conducting psychological evaluations in child protective matters, psychologists are aware that there may be a need to avoid confusion about role boundaries. Psychologists generally do not conduct psychological evaluations in child protection matters in which they serve in a therapeutic role for the child or the immediate family or have had other involvement that may compromise their objectivity. This does not, however, preclude psychologists from testifying in cases as fact or expert witnesses concerning therapeutic treatment of the children, parents or families. In addition, during the course of a psychological evaluation in child protection matters, psychologists do not accept any of the participants involved in the evaluation as therapy clients. Therapeutic contact with the child or involved participants following a child protection evaluation is discouraged and when done, is undertaken with caution. Psychologists asked to testify regarding a therapy client who is involved in a child protection case are aware of the limitations and possible biases inherent in such a role and the possible impact on ongoing therapeutic relationships. Although the court may order psychologists to testify as fact or expert witnesses regarding information they became aware of in a professional relationship with a client, psychologists must appreciate the difference in roles and methods between being psychotherapists and being child protection evaluators. III. Procedural Guidelines: Conducting a Psychological Evaluation in Child Protection MattersIn child protection matters, there are many different situations representing a wide variety of legal and/or ethical considerations. The appropriate procedure in one case may not be appropriate in another. Psychologists should be alert to applicable laws which govern the evaluation, as well as applicable sections of the Ethical Principles and Code of Conduct for Psychologists, particularly those sections dealing with confidentiality. In addition, psychologists appreciate the need for timeliness in child protection matters (e.g., response to evaluation referral, scheduling appointments, completion of report).9. Based on the nature of the referral questions, the scope of the evaluation is determined by the evaluator. The scope of the protection-related evaluation is determined by the nature of the questions or issues raised by the referring agency, person or court, or is inherent in the situation. In child protection matters, psychologists are frequently asked to address parenting deficits. Consequently, psychologists are often asked to propose a rehabilitation plan for the parent(s) or to discuss why prior rehabilitation attempts have failed. The scope and methods of the assessment should be based upon consideration of the referral questions and the appropriate methods by which to evaluate them. Sometimes the evaluation is limited to one parent without attempting to compare the parents. Likewise, the scope may be limited to evaluating the child. At other times, psychologists may be asked to critique the assumptions and methodology of another mental health professional's assessment. Psychologists may also identify relevant issues not anticipated in the referral questions that could enlarge the scope of the evaluation. Also, psychologists might serve as pure expert witnesses in such areas as child development or social psychology, providing expertise to the court without relating it specifically to the parties involved in a particular case. 10. Psychologists performing psychological evaluations in child protection matters obtain appropriate informed consent from all adult participants, and as appropriate, inform the child participant. Psychologists need to be particularly sensitive to informed consent issues. Psychological evaluations in child protection matters are often performed at the request of an agency, by order of a court or at the request of another individual, such as an attorney. Due to the nature of child protection matters, the complexity of the legal issues involved and the potential serious consequences of the evaluation, psychologists need to be particularly sensitive to informed consent issues. Efforts toward obtaining informed consent should make clear to the participant the nature of the evaluation, its purpose, to whom the results will be provided and the role of the psychologist in relation to the referring party (see APA Ethical Principles of Psychologists and Code of Conduct, Standards 1.21 and 1.216 re: third party request for services). This information should be provided in language understandable to the recipient. Because participants in this type of evaluation may feel compelled to cooperate, psychologists should attempt to obtain confirmation of the participants' understanding of and agreement to the evaluation, including its purposes and its implications, prior to the initiation of the evaluation. The Ethical Principles of Psychologists and Code of Conduct requires appropriate informed consent and many state laws require written consent. Should there be refusal to give consent, it may be advisable to refer the individual back to his/her own attorney or seek the guidance of the court or referring agency before proceeding. The purpose of the evaluation, the results and where and to whom the results are distributed are all determined by the individual characteristics of the case as well as by legal requirements and agency regulations. The Ethical Principles of Psychologists and Code of Conduct suggests that psychologists provide information to the child as appropriate, to the extent that the child is able to understand. Psychologists explain to the child the nature of the evaluation procedures. Psychologists attempt to make it clear to the child that his/her safety is the primary interest and because of that interest, the information will be shared with others. Psychologists allow time for questions by the child and answer them in a developmentally and culturally appropriate fashion.11. Psychologists inform participants about the disclosure of information and the limits of confidentiality. Psychologists conducting a psychological evaluation in child protection matters ensure that the participants, including the child (to the extent feasible), are aware of the limits of confidentiality for the evaluation results. Psychologists recognize that evaluation results could be sought by a child protection investigation agency, the court, a guardian ad litem for the child or an attorney for either parent. When an evaluation is court-ordered, there may be special considerations regarding the limits of confidentiality and the disclosure of information. In such cases, psychologists will seek to reconcile the APA ethical standards with fulfilling the demands of the court. A clear explanation of the nature of the evaluation and to whom it will be released takes place.12. Psychologists use multiple methods of data gathering. Psychologists strive to use the most appropriate methods available for addressing the questions raised in a specific child protection evaluation. Psychologists generally use multiple methods of data gathering, including but not limited to, clinical interviews, observation and/or psychological testing that are sufficient to provide appropriate substantiation for their findings. Psychologists may review relevant reports (e.g. from child protection agencies, social service providers, law enforcement agencies, health care providers, child care providers, schools and institutions). In evaluating parental capacity to care for a particular child or the child-parent interaction, psychologists make efforts to observe the child together with the parent and recognize the value of these observations occurring in natural settings. This may not always be possible, for example, in cases where the safety of the child is in jeopardy or parental contact with the child has been prohibited by the court. Psychologists may also attempt to interview extended family members and other individuals when appropriate (e.g., caretakers, grandparents and teachers). If information gathered from a third party is used as a basis for conclusions, psychologists attempt to corroborate it from at least one other source wherever possible. The corroboration should be documented in the report.13. Psychologists neither over-interpret nor inappropriately interpret clinical or assessment data. Psychologists refrain from drawing conclusions not adequately supported by the data. Psychologists interpret any data from interviews or tests cautiously and conservatively, strive to be knowledgeable about cultural norms and present findings in a form understandable to the recipient. Psychologists strive to acknowledge to the court any limitations in methods or data used. In addition, psychologists are aware that in compelled evaluations the situation may lend itself to defensiveness by the participant, given the potentially serious consequences of an adverse finding. Consequently, the situational determinants should be borne in mind when interpreting test findings.14 . Psychologists conducting a psychological evaluation in child protection matters provide an opinion regarding the psychological functioning of an individual only after conducting an evaluation of the individual adequate to support their statements or conclusions. This guideline does not preclude psychologists from reporting what an individual has stated or from addressing theoretical issues or hypothetical questions, so long as any limitations of the basis of such information are noted. When, despite reasonable effort, a personal evaluation of an individual is not feasible, psychologists report this and appropriately limit the nature and extent of their conclusions or recommendations.15. Recommendations, if offered, are based on whether the child's health and welfare have been and/or may be seriously harmed. When conducting a psychological evaluation in child protection matters, psychologists may choose to make a variety of recommendations, including but not limited to, psychological treatment for the child, psychological treatment for the parent(s), and/or suggestions for parental rehabilitation that would help create a safe environment for the child. If recommendations are made, the primary focus must be the child's health and welfare. Recommendations are based on sound psychological data, such as clinical data, interpretations and inferences founded on generally accepted psychological theory and practice. Particular attention may be given to outcomes research on interventions with abusive families. Psychologists strive to disclose relevant information and clinical data pertaining to the issues being evaluated while maintaining an awareness of the limitations in predicting future violent behavior. They also explain the reasoning behind their conclusions. The profession has not reached consensus about whether making dispositional recommendations in child protection evaluations is within the purview of psychological practice. However, if psychologists choose to make dispositional recommendations, the recommendations should be derived from sound psychological data and must be based on considerations of the child's health and welfare in the particular case. 16. Psychologists clarify financial arrangements. Financial arrangements are clarified and agreed upon prior to conducting a child protection evaluation. When billing for an evaluation, psychologists accurately describe the services provided for reimbursement purposes.17. Psychologists maintain appropriate records. All data obtained in the process of conducting a child protection evaluation are properly maintained and stored in accordance with the APA Record Keeping Guidelines (APA, 1993). All records, including raw data and interview information, are recorded with the understanding that they may be reviewed by other psychologists, the court or the client. Burden of proof: an obligation by a party (e.g., plaintiff in civil cases, the state in a termination of parental rights matter) to demonstrate to the court that the weight of the evidence in a legal action favors his/her side, position or argument. Beyond a reasonable doubt: highest standard of proof used in cases where the loss of liberty interests are at stake (e.g., incarceration or loss of life). Generally defined as the highest degree of support or level of certainty (90-95% chance).Child Protective Services (CPS): The social service agency (in most states) designated to receive reports, investigate and provide rehabilitation services to children and families with problems of child maltreatment. Frequently, this agency is located within a large public entity, such as a department of social services or human services.Clear and convincing: intermediate standard of proof used in cases when significant liberty interests are at stake (e.g., loss of parental rights, civil commitment). Generally defined as a high degree of support or level of certainty (75% chance).Disposition hearing: held by the Juvenile/Family Court to determine the disposition of children after cases have been adjudicated, includes determinations regarding placement of the child in out-of-home care when necessary and services needed by the children and family to reduce the risks and address the effects of maltreatment.Evidence: any form of proof presented by a party for the purpose of supporting its factual allegation or arguments before the court.Expert witness: an individual who by reason of education or specialized experience possesses superior knowledge respecting a subject about which persons having no particular training are incapable of forming an accurate opinion or deducing correct conclusions. A witness who has been qualified as an expert will be allowed (through his/ her answers to questions posted) to assist the jury in understanding complicated and technical subjects not within the understanding of the average lay person. Experts are also allowed to provide testimony based on "hypothetical" scenarios or information/opinions which are not specifically related to the parties in particular legal action.Fact witness: generally defined as an individual who by being present, personally sees or perceives a thing; a beholder, spectator or eyewitness. One who testifies to what he/she has seen, heard, or otherwise observed regarding a circumstance, event or occurrence as it actually took place; a physical object or appearance, as it usually exists or existed. Fact witnesses are generally not allowed to offer opinion, address issues that they do not have personal knowledge of or respond to hypothetical situations.Family/Juvenile court: courts specifically established to hear cases concerning minors and related domestic matters such as child abuse, neglect, child support, determination of paternity, termination of parental rights, juvenile delinquency, and family domestic offenses.Family preservation/reunification: the philosophical belief of social service agencies, established in law and policy, that children and families should be maintained together if the safety of the children can be ensured.Guardian ad litem: generally defined as an adult appointed by the court to represent and make decisions for someone (such as a minor) legally incapable of doing so on his/her own in a civil legal proceeding. The guardian ad litem can be any adult with a demonstrated interest.Guardianship: legal right given to a person to be responsible for the necessities (e.g., food, shelter, health care) of another person legally deemed incapable of providing these necessities for him/ herself.Maltreatment: generally defined as actions that are abusive, neglectful, or otherwise threatening to a child's welfare. Commonly used as a general term for child abuse and neglect.Neglect: generally defined as an act of omission, specifically the failure of a parent or other person legally responsible for a child's welfare to provide for the child's basic needs and proper level of care with respect to food, shelter, hygiene, medical attention or supervision.a. emotional: generally defined as the passive or passive-aggressive inattention to a child's emotional needs, nurturing or emotional well-being. Also referred to as psychological unavailability to a child.b. physical: generally defined as a child suffering, or in substantial risk of imminently suffering, physical harm causing disfigurement, impairment of bodily functioning, or other serious physical injury as a result of conditions created by a parent or other person legally responsible for the child's welfare, or by the failure of a parent or person legally responsible for the child's welfare to adequately supervise or protect him/her.Out-of-home care: child care, foster care, or residential care provided by persons, organizations, and institutions to children who are placed outside of their families, usually under the jurisdiction of Juvenile/Family Court. Parens patriae: refers traditionally to the role of state as sovereign and guardian of persons under legal disability. It is a concept of standing utilized to protect those quasi-sovereign interests such as health, comfort and welfare of the people, interstate water rights, general economy of the state, etc. Literally means "parent of the country. "Petition: a formal written application to the court requesting judicial action on a particular matter.Preponderance of evidence: lowest of the three standards of proof, and applied in most civil actions; generally defined as "probable" degree of certainty (e.g., "more likely than not" or 51% chance).Protection order: may be ordered by the judge to restrain or control the conduct of the alleged maltreating adult or any other person who might harm the child or interfere with the disposition.Review hearing: held by the Juvenile/Family Court to review dispositions (usually every 6 months) and to determine the need to maintain placement in out-of-home care and/or court jurisdiction of a child. Every state requires state courts, agency panels, or citizen review boards to hold periodic reviews to reevaluate the child's circumstances if s/he has been placed in out-of-home care. Federal law requires, as a condition of Federal funding eligibility, that a review hearing be held within at least 18 months from disposition, and continue to be held at regular intervals to determine the ultimate resolution of the case (i.e., whether the child will be returned home, continued in out-of-home care for a specified period, placed for adoption, or continued in long-term foster care). Termination of parental rights hearing: formal judicial proceeding where the legal rights and responsibility for a child are permanently or indefinitely severed and no longer legally recognized and where the state assumes legal responsibility for the care and welfare of the child. American Psychological Association. (1985). Standards for educational and psychological testing. Washington, DC: Author. Baladerian, N.J. (1991). Abuse causes disabilities. Disability and the Family, Culver City, California: SPECTRUM Institute. Greenberg, S., Shuman, D.W. (1997). Irreconcilable conflict between therapeutic and forensic roles. Professional Psychology: Research and Practice, 28, 50-57. McClain, P. (1995). [Centers for Disease Control and Prevention] (Anne Marie Finn). Atlanta, Georgia. McClain, P., Sacks, J., & Frohlke, R. (1993). Estimates of Fatal Child Abuse and Neglect, United States, 1979-1988. Pediatrics, 91, 338-343. Santosky v. Kramer, 455 U.S. 745 (1982). U.S. Advisory Board on Child Abuse and Neglect. (1995). A National Shame: Fatal Child Abuse and Neglect in the U.S. (5th Report). Washington, D.C.: U.S. Government Printing Office. Butcher, J.N. & Pope, K.S. (1993). Seven issues in conducting forensic assessments: Ethical responsibilities in light of new standards and new tests. Ethics and Behavior, 3, 267-288. Briere, J. (Ed.). (1991). Treating victims of child sexual abuse. New Directions for Mental Health Services series, 51. Ceci, S. (1995). Jeopardy in the courtroom. Washington, DC: American Psychological Association. Committee on Ethical Guidelines for Forensic Psychologists (1991). Specialty guidelines for forensic psychologists. Law and Human Behavior, 6, 655-665. Conte, J.R. (1986). A look at child sexual abuse. Chicago: National Committee for Prevention of Child Abuse. Coulborn-Faller, K. (1988). Child sexual abuse: An Interdisciplinary manual for diagnosis case management and treatment. New York: Columbia University Press. Daro, D.H., & McCurdy, K. (1993). Current trends in child abuse reporting and fatalities: The results of the 1993 annual fifty state survey. Chicago: National Committee to Prevent Child Abuse. Doris, J. (Ed.). (1991). The suggestibility of children's recollection: Implications for eye witness testimony. Washington, DC: American Psychological Association. English, D.J. (1989). Risk assessment: Issues and concerns. Denver: American Humane Society. Faller, K.C., Everson, M.D. (Eds.). (1996). Child interviewing, Part I. Child Maltreatment 1, 83-175. Faller, K.C., Everson, M.D. (Eds.). (1996). Child interviewing, Part II. Child Maltreatment 1, 187-212. Friedreich, W.N. (1990). Psychotherapy of sexually abused children and their families. New York: Norton. Goldstein, J., Frend A., Solnit A.J., & Goldstein, S. (1986). In the best interests of the child. New York: Free Press. Grisso, T. (1986). Evaluating competencies: Forensic assessments and instruments. New York: Plenum. Hagans, K.B., & Case, J. (1988). When your child has been molested: A parent's guide to healing and recovery. New York: Lexington Books. Hass, L.J. (1993). Competence and quality in the performance of forensic psychologists. Ethics and Behavior, 3, 251-266. Helfar, R.E., & Kempe, R.S. (Eds. ), (1987). The battered child (4th ed.). Chicago: University of Chicago Press. Kalichman, S.C. (1993). Mandated reporting of suspected child abuse: Ethics, law and policy. Washington, DC: American Psychological Association. Kalichman, S.C. Craig, M.E., & Follingstad, D.R. (1988). Factors influencing the reporting of father-child sexual abuse; study of licensed practicing psychologists. Professional Psychology, 20, 84-89. Koocher, G.P., & Keith-Spiegel, P.C. (1990). Children ethics, and the law: Professional issues and cases. Lincoln: University of Nebraska Press. Melton, G.B., Petrila, J., Poythress, N.G., & Slobogin, C. (1997). Psychological evaluations for the courts: A handbook for mental health professionals and lawyers. New York: Guilford Press. Myers, J.E.B. (1997). Evidence in child abuse and neglect cases (Vols. 1-2). New York: John Wiley & Sons. Reiser, M. (1991). Recantation of child sexual abuse cases. Child Welfare, 70, 611-623. Roane, T. (1992). Male victims of sexual abuse: A case review within a child protective team. Child Welfare, 71, 231-241. Sales, B., & Simon, L. (1993). Institutional constraints on the ethics of expert testimony. Ethics and Behavior, 3, 231-249. Santosky v. Kramer, 102 S. Ct. 1388 (1982). Saunders, T.R. (1991). An overview of some psychological issues in child physical and sexual abuse. Psychotherapy in Private Practice, 9(2), 61-78. Walker, C.E., Bonner, B.L., & Kaufman, K.L. (1988). The physically and sexually abused child: Evaluation and treatment. Elmsford, NY: Pergamon Press. Watson, H., & Levine, M. (1989). Psychotherapy and mandated reporting of child abuse. American Journal of Orthopsychiatry, 59, 246-255. Weissman, H. (1991). Forensic psychological examination of the child witness in cases of alleged sexual abuse. American Journal of Orthopsychiatry, G1, 1, 48-58. White, S. (1990). The contamination of children's interviews. Child Youth and Family Service Quarterly 13(3) 6, 17-18. Willis, D.J., Bagwell, W., Broyhill, G.C., & Campbell, M.M. (1991). Child abuse: Abstracts of the psychological and behavioral literature: Vol. 2, 1986-1990. Washington, DC: American Psychological Association. Willis, D.J., Bagwell, W. & Campbell, M.M. (1991). Child abuse: Abstracts of the psychological and behavioral literature: Vol. 1, 1967-1985. Washington, DC: American Psychological Association. 1These guidelines were drafted by the Committee on Professional Practice and Standards (COPPS), a committee of the Board of Professional Affairs (BPA). COPPS is responsible for developing and recommending to BPA standards and guidelines for providers of psychological services and for monitoring, evaluating, and developing information regarding the scientific and professional aspects of psychological services. This paper was developed under the auspices of COPPS, reviewed by numerous APA divisions, committees, and state psychological associations, and is endorsed by the BPA. The document reflects the contributions of many psychologists. The manuscript was drafted by COPPS members Catherine Acuff, Ph.D.; Steven Bisbing, Ph.D.; Michael Gottlieb, Ph.D.; Lisa Grossman, Ph.D.; Jody Porter, Ph.D.; Richard Reichbart, Ph.D.; Steven Sparta, Ph.D.; and C. Eugene Walker, Ph.D. COPPS also acknowledges and appreciates the support of APA staff members Billie Hinnefeld and Cherie Jones. Correspondence concerning this paper should be addressed to the Practice Directorate, American Psychological Association, 750 First Street, NE, Washington, DC 20002-4242. 2 For example, the role of psychologists acting as a psychotherapists, conducting individual or family psychotherapy, is very different from the role of psychologists conducting formal child protection evaluations (Greenberg and Schumann, 1997). 3 At times, these guidelines refer to other APA documents such as the ethics code, test standards, and record keeping guidelines. These documents undergo periodic review and revision. Therefore, the reader is advised to refer to the most recent edition. Study of appointed advocates for children produces some surprising results and a challenge for the group that asked for it. The Court Appointed Special Advocate (CASA) program couldn't sound more apple pie, more thousand points of light. CASAs are a cadre of 74,000 volunteers trained for dozens of hours, then dispatched to conduct independent investigations of child abuse and to represent the children's interests in courts around the nation. What could be wrong with that? Virtually nothing, according to past evaluations. A qualitative consumer satisfaction survey of 23 CASA programs last year, commissioned by the National CASA Association, gave glowing reviews. So, a second, more ambitious evaluation, a national one including a control group, seemed without risk. That's not how it turned out. While containing some information for national CASA to brag about - such as judges assigning CASAs to the most difficult cases, then frequently doing exactly what the advocates recommend - the report commissioned by the association delivers some surprisingly damning numbers. It says CASAs, an overwhelmingly white and female group, spend little time on cases, and even less on those of black children. It says youngsters with CASAs are associated with more removal from parents, less kinship care and less reunification with parents. CASA critics, including social workers who say problems in child welfare should be addressed by hiring more professionals rather than relying on volunteers, seized on those numbers, contending that they prove CASAs might actually harm children and families. CASA officials focus on the positive findings and argue that the negative ones are questionable or need more study. Even the evaluation's author, Caliber Associates, has taken the unusual step of responding to CASA critics by stressing that some of the numbers may not prove anything because the controls in the study may have been faulty. Whatever the truth about CASAs, the organization's experience with the study illustrates an increasingly important point for the youth field: the risks that groups take when complying with mounting demands from government and foundation funders to prove that what they do works. Beginning in 1997 and ending in 2000, Piraino received three grants totaling $1 million from the David and Lucile Packard Foundation of Los Altos, Calif. The grants paid for software, called COMET, to help local CASA organizations track information, such as the hours that volunteers spent on cases and how many recommendations were accepted by judges. The grant also paid for two evaluations: the first, a qualitative study conducted by Pat Litzelfelner of the University of Kentucky College of Social Work, and the recently released quantitative study by Caliber. In Litzelfelner's satisfaction survey, which began in 2001 and examined responses from 742 judges, lawyers, parents, foster parents and social workers, every group gave CASA a positive ranking on every question. The questions ranged from whether the respondent understood the role of a CASA (which got the highest scores) to whether the CASA visited the children regularly (which got among the lowest). Litzelfelner notes that her results can't be generalized to all CASA programs because the sites surveyed were not randomly selected. CASA critic Richard Wexler, executive director of the National Coalition for Child Protection Reform, points to comments from caseworkers that CASAs needed to spend more time on cases, and that many CASAs have middle-class values and do not appreciate the different cultural backgrounds of their clients. Wexler says these comments reinforce his contention that CASA is little more than a bunch of white women with matching shoes and purses telling poor black mothers how to run their households. The Caliber study, which cost $317,000, was based on COMET data and on the U.S. Department of Health and Human Services' (HHS) National Survey of Child and Adolescent Well-being, which contains statistics on 5,500 children from across the country. Twenty-five of the 915 CASA organizations around the country provided information from their COMET databases. Among Caliber's findings from COMET: Ninety percent of volunteers were white, and 79 percent were women. Only 8 percent were African-American, a sharp contrast to the children in the nation's child welfare system, 40 percent of whom are African-American, according to HHS statistics. Piraino says that among all CASAs nationwide (as opposed to the 25 CASA organizations studied), 18 percent are African-American, a figure he notes has increased from 13 percent five years ago. The COMET data also showed that after receiving an average of 43.9 hours of training, volunteers spent 3.2 hours a month working on the case to which they were assigned. When this figure was announced at the CASA national conference in Washington in June, a sucking noise of disbelief was audible, recalls Dennis S. Hockensmith, executive director of the Pennsylvania CASA Association. CASA directors across the country say their volunteers give much more time than the report says. Caliber says the number in its report may be incorrect because CASAs may not have done a good job of logging their hours on COMET. Volunteers are asked but not required to log their hours, and it is unclear how many of them do it promptly or completely. The data did show that volunteers spent most of their time with the children, much more than on other activities, such as writing reports for the court and interviewing parents and foster parents. But when the child was black, the amount of time spent per month dropped by more than an hour per volunteer. On the positive side, the data also showed that in 61 percent of cases, judges accepted every one of the volunteers' recommendations. But there was this oddity, considering the overwhelming number of white women volunteers: Judges were four times more likely to abide by advice from men than from women, and 2.5 times more likely to follow recommendations from African-American volunteers than those of other races. From there, the findings get more controversial, and the research more tricky. National CASA has long suspected that CASA volunteers are assigned the most serious and difficult child abuse and neglect cases that come before the judges. Using data from the federal well-being survey, Caliber confirmed that. The results: Children who were assigned CASAs, and their parents, received more services than those without CASAs. Children without CASAs weren't any more likely that those with CASAs to be mistreated again, and they stayed in the child welfare system about the same amount of time. But CASA kids were more likely to be removed from their parents: 89 percent of the time for CASA kids, compared with 18 percent for non-CASA kids. For children whose cases remained open at the end of the study period, CASA kids were less likely to be reunified with their parents and less likely to have been placed with kin. Wexler jumped on the findings, saying the study showed that the CASA program "does nothing to actually improve the lives of children and may well make them worse." Part of Wexler's criticism of CASA stems from his conviction that judges, based on recommendations from child welfare caseworkers and CASAs, remove children from their parents far too often. By contrast, for people like David W. Soukup, who founded CASA when he was a judge in Seattle, these removals usually signal that the system is working to protect abused children. Policy differences aside, Caliber says Wexler misconstrued its report. But the consultant has also backed away from some of its own findings. Caliber says that when it used a mathematical model to test the control group findings, it discovered that it may have failed to establish comparable groups. "It doesn't look statistically plausible to me that having a CASA has more of an effect than the type of abuse, what is going on with parents, et cetera," says Caliber senior associate Jennifer Brooks, who worked on the study. So, the most that can be said about the findings is that there is a relationship between the CASA and other effects, such as more frequent removal from parents. But the study, Caliber researchers say, probably does not show that the CASA caused that effect. Raymond Kirk, research professor at the school of social work at the University of North Carolina/Chapel Hill, agrees that the comparison group findings should be viewed with caution. "The CASA model should not be over applauded or criticized," he says. "The science part of this report is too soft for that." The feelings of Susan Cammarata, a Pittsburgh attorney with some expertise in child welfare cases and several years of experience as a CASA volunteer, may represent that perspective. The Caliber evaluation confirmed her inklings. "CASA has its place," she says, "but I would rather see the child welfare system improved." The Packard Foundation, the funder, declined to comment on the evaluation's findings. One reason the findings threw CASA officials for a loop is that, although they were participating in a scientific evaluation, what they really wanted was validation. A statement on the National CASA Association website calls the Caliber study part of CASA's commitment to "measuring success in our work." "We hear good stories about what we do for kids," Piraino says. "But we wanted to document it. It's not surprising, then, that CASAs were taken aback when the report suggested that what they thought about themselves might not be true. The reaction of CASA organizations to the negative parts of the report has almost uniformly been denial. Kelly Warner, spokeswoman for the Oklahoma CASA Association, says, "I read the study and my reaction was: Who are they talking about? Because this cannot be Oklahoma. I do not think we are doing something wrong." National CASA has boasted about the parts of the study it liked, while saying the findings that could be considered critical are questionable and in need of further study. This might be a natural organizational reaction, but it can border on duplicity. Trudy Strewler, executive director of the Pikes Peak Region CASA, based in Colorado Springs, Colo., is among those who say CASAs should be proud of the results showing that CASA kids and families get more services. The National CASA Association has emphasized that result as well - even though it comes from the same part of the study in which the association rejects the negative findings because of potential control group problems. As for those negative findings, CASA organizations are calling for more study and improved data collection. Hockensmith says of the racial disparity in the time CASAs spend on cases, "I am sure CASA will look long and hard at that. It needs to be analyzed more deeply." And Warner of Oklahoma is among those who say volunteers must improve data collection by being more diligent about recording their time in the COMET database. Faltering on an accountability test can't be all that bad. After all, every state in the nation has failed the federal Child and Family Service Reviews of their child welfare programs, and HHS, the agency holding their purse strings, hasn't done a thing about it. The negative findings in the Caliber study didn't prompt CASA to promise changes in practices. "National CASA will not allow inconvenient facts to get in the way of its insistence that CASA is a success," Wexler said in a news release. "This state of denial only compounds the harm done by the program itself." CASA's attempts to stress the positives may be nothing more than instinctual self-preservation. Negative evaluation findings, followed by an outcry from critics, could hinder a youth group's ability to raise money and expand. Piraino concedes that the report could hurt CASA. "It depends on how people look at it," he says. If they believe the criticisms sound too simplified, he says, the evaluation won't be a problem. It can't be much help, however, in places like Cleveland, one of the last major CASA holdouts. Cuyahoga County Juvenile Division Senior Judge Peter J. Sikora says he prefers to have children represented by licensed attorneys who are trained for the work by the bar association and who may be held accountable for their performance in ways that volunteers cannot be, such as loss of license. Because it would be costly to start and run a CASA program, Sikora says he'd have to be convinced of its value before moving in that direction. "Our court was taking a bit of criticism for not having a CASA program," he says. "But unless you can show me children and families benefit, and can show me a cost benefit, I see no reason to switch from the system where children are represented by licensed attorneys." The Caliber evaluation won't do that for him. Maybe another study will. Caliber is recommending that one be done in the same form as a double-blind medical investigation, where some patients get an experimental drug and some get a sugar pill. He agrees that it might be done in a place where there is no CASA program, so that judges will feel that they're getting something they didn't have before (CASAs), at least for half the serious cases. Perhaps Piraino's hometown of Cleveland would work. The Court Appointed Special Advocates program was created in 1977 by a Seattle judge, David Soukup, who was desperate to get more information about abused and neglected children and their families so that he could make better decisions. He wanted trained volunteers to research family situations and provide crucial information to the court. As of last year, there were 73,860 volunteers in 915 CASA programs in 49 states, the Virgin Islands and Washington, D.C. The National CASA Association has a budget of $14 million, $12 million of which comes from Victims of Crime Act through the U.S. Department of Justice. • CASA volunteers were 90 percent white, 8 percent African-American and 79 percent female. They served a child population that was 48 percent white, 36 percent African-American or biracial and 49 percent female. Hispanic or Latino children made up 5 percent of the study group. That racial statistic was not given for CASAs. The study found that judges assigned CASAs to disproportionately fewer Hispanic and Latino children. The mean number of hours per month that CASAs spent on African-American children was 2.67, vs. 4.30 for children of other races. • Most CASAs (87 percent) had college degrees or had taken college courses. College-educated CASAs spent significantly less time, 3.12 hours a month, volunteering than did others, who gave 4.37 hours. Judges ordered implementation of all the recommendations of college-educated CASAs twice as often as they did recommendations from those without degrees. • The average CASA received 43.9 hours of training, then spent an average of 3.2 hours a month working on cases. Caliber questioned the validity of the 3.2-hour finding, because it also found that one-third of the volunteers recorded spending no time with the children, which the researchers believe was unlikely. • CASAs spent more time each month (about 45 minutes more) with children who had prior placements outside the home. Volunteers spent less time on cases each month those cases were open. • Judges overwhelmingly take CASA advice. In 61.2 percent of cases, every one of a CASA's recommendations were ordered by the court. Judges were four times as likely to accept all of the recommendations offered by the small number of male volunteers as from the female volunteers, and 2.5 times as likely to order all of the actions advised by African-American volunteers. • Children assigned CASAs were more likely to be assessed by caseworkers as having experienced a severe level of harm and to be at severe risk for harm. They were significantly more likely to have been mistreated previously and to have received child welfare services in the past. • Children with CASAs and their parents received significantly more services than those without CASAs, but there was no difference between the CASA and non-CASA groups in percentage of parents' or children's needs that were met. • For children whose cases were closed by the end of the study, those with or without CASAs were no more likely to experience additional maltreatment. The two groups stayed in the child welfare system about the same amount of time. Children who had CASAs were more likely to have been removed from their parents. • Among children whose cases remained open, there also was no difference in new reports of maltreatment. But all of those with a CASA were removed from their parents, while only 45 percent of those without a CASA were removed. • Among the children who were removed and whose cases remained open, those with a CASA were more likely to remain in foster care and less likely to be assigned to live with kin. • Among children who had been removed from their parents and whose cases had closed, there was no difference in placement with kin or reunification with parents. • There was only one difference in the 16 measures of well-being for children who had a CASA and those who did not: Adolescents without a CASA reported slightly greater support in their relationships with adults. Every weekend, Jessica Regelman takes her twins for an outing, which would be unremarkable, except that technically, they aren't hers anymore. They belong to Vicky and Dr. Steven Neeley of Brighton Township. The Neeleys adopted Alex and Amber on Sept. 3, just days before the toddlers turned 2. Regelman still gets to see them because she chose the Neeleys to adopt her children, much against the wishes of Beaver County Children and Youth Services. But Beaver County CYS didn't just fight her attempts to choose adoptive parents for her son and daughter. It also acted quickly to end her parental rights, even though she had never been accused of abusing or neglecting her children. CYS officials got involved after Regelman, a single mother with learning disabilities who had been under CYS supervision as a teen, called them for help dealing with her premature twins. She thought they'd help her care for the babies, who were on heart monitors. Instead, CYS put the twins in foster care the day they left the hospital. But CYS didn't stop there. Even after the babies were off the monitors, the agency repeatedly refused to let Regelman care for them, and then began trying to terminate her parental rights when the twins were just nine months old. Later, the agency refused to consider Regelman's request that the Neeleys be allowed to adopt. Federal law requires child welfare agencies to do whatever they can to keep families intact, and the Neeleys firmly believe that Regelman could have managed her babies with a little help. Also, federal law envisioned agencies spending twice as much time in working to return children to parents as CYS gave Regelman. In addition, many child welfare agencies across the country grant parents' requests that children be adopted by specific relatives or friends -- such as the Neeleys -- in exchange for voluntary relinquishment of parental rights. But CYS refused to consider the Neeleys until after they had hired prominent Beaver attorney Albert A. Torrence to represent Regelman. Like the Neeleys, Torrence thought all Regelman needed was a little assistance from CYS to care for two fragile newborns. Instead of helping her, Torrence felt CYS was determined to terminate Regelman's rights and place the babies for adoption with a couple the agency had chosen. Alex and Amber were born seven weeks prematurely at Magee Womens Hospital on Sept. 13, 1997. Together, they weighed less than eight pounds. The hospital connected them to monitors that would sound alarms if the babies forgot to breathe, as preemies sometimes do. Regelman was intimidated. She was a 21-year-old responsible for two tiny babies tangled in wires. She had broken off her relationship with the babies' father, who is mildly retarded and has a criminal record for indecent assault and resisting arrest. She also knew her own limitations. At the age of 6, she'd been struck in the head by a mirror on a passing car. As a result, she had some learning disabilities. Vicky Neeley, who was a special education teacher before her children were born, described Regelman this way: "She is not really mentally retarded. Her reasoning ability is affected, but she takes the bus, passed CPR, can handle money. She has a perfect memory." Regelman thought CYS was the kind of agency that would help her care for the newborns because they'd helped her when she was a rebellious teen-ager who repeatedly ran away from home. CYS assisted her grandmother, who was raising her, by enrolling Regelman in after-school activity programs. When Regelman called CYS from Magee, it never occurred to her that the agency would take the twins from her. She thought the agency would send someone to her house occasionally to help her care for them. But CYS did take the babies, and placed them in separate foster homes. Later, after Regelman and her grandmother requested it several times, CYS put the twins in the same home. CYS gave Regelman two one-hour visits a month with her infants, the briefest time permitted by state law. Torrence said that is not nearly enough time for bonding to occur between parents and newborns. Much later, when Torrence asked a hearing officer to increase the visiting time, CYS resisted strongly. Witold Walczak, director of the Greater Pittsburgh chapter of the American Civil Liberties Union, believes the agency deliberately limits visits as part of its strategy to terminate parental rights. Walczak, who has forced reversal of two Beaver County terminations, explains that a weak bond, no matter what its cause, may be used against a parent in termination proceedings. The agency's initial focus isn't supposed to be termination. In 1997, when the twins were born, child welfare agencies like CYS were expected to spend 18 months helping parents get their children back, and most in Pennsylvania tried longer than that. Regelman's first caseworker, Debbie Burr, seemed intent on following that federal direction. She gave Regelman moral support and provided her with a family service plan, which is a list of tasks that parents must complete, with CYS help, to get their children back. Regelman began attending classes on good parenting and on cardiopulmonary resuscitation, which was necessary because of her babies' premature birth. But Burr's supervisor, Thomas Bond, made it clear he did not want the babies returned to their mother. For the hearing on whether to leave the children in foster care, Bond ordered Burr to subpoena witnesses who would testify about Regelman's troubled teen years, although by then, Regelman was 21 and had a stable relationship with a 56-year-old man, who was not the babies' father but who adored them. Despite the testimony of those witnesses, a hearing officer decided that Regelman could get the twins if she lived with her grandmother, who would serve as a backup for her. Her boyfriend, who was less available because he worked full-time, was to be a secondary helper. The day Regelman and her grandmother got Alex and Amber, their monitor alarms rang constantly. "She felt the kids were in danger," Torrence said later. "She had no sleep and was overwhelmed. It had to be a nightmare." Regelman called the foster mother and CYS the following morning and asked them to take the twins. She wanted to make sure the children were safe. "She did the right thing," Torrence said. "I really respect her for that." She didn't find out until later that the monitor wires were not properly connected when CYS gave her the babies. Even after the monitors were fixed, CYS refused Regelman's requests to get her babies back. Inside the agency, Burr and Bond continued to argue over Regelman's competency. Burr wrote that Regelman was resourceful and aware of her limits, that she understood the daily care and needs of infants, and that she faithfully visited her babies. Burr believed Regelman could raise the twins with help. He took Burr off Regelman's case. He replaced her with Beth Hornyak, who wrote a report saying Regelman had a history of acting out impulsively and that she was easily frustrated and overwhelmed during her visits with the children. She concluded that Regelman could not care for the twins. Regelman said Bond and Hornyak both treated her badly. "They were mean, the way they acted toward me." Her grandmother, Gale Regelman, backed that up, saying Hornyak told her she could no longer visit the babies because she was their great grandmother, not their grandmother. As time passed, Regelman did everything CYS ordered, but still Hornyak wasn't satisfied. Regelman began to believe that no matter what she did, CYS would never return her babies to her. And then, she said, Hornyak told her that if she had another child, CYS would take that baby too. Regelman couldn't endure that again. So, at the age of 21, she underwent sterilization surgery. "I hated to do it," she said. "I would have liked to have one more. I wanted three kids. But it doesn't happen when you are involved with CYS and they threaten you." Bond, Hornyak and Burr are prohibited by state regulations and agency rules from talking about Regelman's case. Beaver County CYS Director Victor Colonna declined to discuss the case, citing state regulations. On June 20, 1998, when the twins were just 9 months old, the agency changed the goal for them to adoption. Regelman's caseworker began pressuring her to sign away her parental rights to her children. "They told her, 'You know you are mentally retarded. You are not married and not capable of raising your kids.' They had her half convinced," Torrence said later. Regelman said Hornyak kept after her all summer. "She asked me to sign papers to give up my rights to the babies and she got mad when I wouldn't. They got mad at me for a lot of things. I knew what they were up to. Just because I was in an accident, I am not stupid. They were just trying to take the babies all along." Meanwhile, within the agency, workers had offered up the names of a dozen potential adoptive couples for Regelman's babies. It's not clear how CYS narrowed those down to the family it chose. Regelman said CYS made it clear to her that the adoptive family would not let her see the babies again, so she began searching for a couple willing to enter an open adoption, one in which she could maintain a relationship with her children. Her boyfriend suggested the Neeleys, whom he'd known for 12 years through church. Regelman called them. It was a perfect match. The Neeleys had been trying for years to adopt through an agency that places children who have mental or physical disabilities, but the agency never seriously considered them because they had seven biological children of their own, and by the time Regelman met them, Vicky Neely was pregnant again. The Neeleys called CYS, but officials there, citing confidentiality regulations, refused even to acknowledge that the twins were in the agency's care, let alone discuss the possibility that they'd be available for adoption. CYS said it couldn't give the Neeleys information even if Regelman said it was all right. The Neeleys next turned to Torrence, who was a friend of the family. The Neeleys paid him to defend Regelman against CYS' attempt to terminate her parental rights. He got the termination hearing postponed, but then found out CYS had picked an adoptive family and had no intention of considering the Neeleys. Torrence wrote CYS to tell them he thought they'd failed to give Regelman an adequate opportunity to prove she could be a good parent. Keeping her children away from her because of one day and night when she was overwhelmed by malfunctioning medical monitors was not justified, he said. If CYS did terminate her rights, though, he told the agency that the Neeleys should be considered as adoptive parents because the law does not preclude a mother from designating who adopts her children. He reiterated those points at a hearing on Nov. 18, 1998, and the hearing officer gave Regelman additional visiting time with the babies, over the objections of CYS. As he prepared for the termination trial, Torrence added Debbie Burr, Regelman's original caseworker, to his witness list to testify against CYS. He also pointed out that CYS' argument for termination was weak because Regelman had completed her family service plan requirements. Before the trial even began, CYS negotiated a settlement. The agency agreed to withdraw the termination petition if the babies went to the Neeleys, not Regelman. Regelman accepted the deal. She feared that if she didn't, the agency would somehow terminate her rights anyway. And she had the Neeleys' promise that she could see her children. The Neeleys now have three two-year-olds: Alex and Amber, and their toddler, Ruthe, who is three months older. They have a 10-month-old baby, Olivia Leona. And they have six older children, Eleanor, 4; Steven, 7; Victoria, 9; Elizabeth, 12; JoAnna, 14, and Sarah, 16. They have two washers and two dryers and pay for outside help at least two days a week. Regelman still wishes she could have kept her children, but she is grateful to the Neeleys. "CYS wanted it so that Alex and Amber would not know their real mother, just the people who adopted them. They shouldn't do that. Every child has a right to know who their real parents are. My kids will know me and they will know Vicky as their mom too."